Artwork done with oil paint or acrylic is usually painted on a support of stretched or mounted canvas. In a small percentage of cases it is painted on wood or metal panels. This type of artwork, if properly varnished, does not have to be framed with glass because the surface is more easily cleaned and is less subject to permanent damage from mechanical disturbances. Nevertheless, a cer­tain amount of additional protection is needed, which can be supplied by the edge of the moulding used to make the picture frame. The moulding covers the edge of the painting and protrudes above the surface of the painting. This helps to protect against the most common form of mechanical abuses and problems in handling. Paper artwork, from the outset of its development, was framed for protection first and for decoration second. This is not true in the case of early frescoes and paintings done on panels. The earliest picture frames were made to create a focal point or atmosphere in which the artwork could be seen. The oldest known frames were doorways or archways that served as a focal point through which to view a scene or to outline some architecture, as well as serving as an entrance or exit. Today, a carpenter’s term for the process of installing a door is still “fram­ing a door.” It was not until the late seventeenth century, when painting had developed the technology to be portable, that the notion of protection came to be a major consideration. The following rules apply to art on canvas and panels with oil paints or acrylics. 1. Never attempt a perfect fit; you must leave sufficient breathing space for expansion and contraction of the artwork and the materials used in framing it. The standard allowance for paper art with glass is 1/16 inch and for stretched art it is 1/8 inch if possible. Some commercial mouldings, because of the width of the “rabbet” (the lip of the moulding into which the artwork is installed), do not allow for 1/8 inch and you may have to settle for 3/32 inch to prevent the edge of the picture from showing. The larger allowance is recommended because stretched artwork is not sealed from atmospheric conditions and is more subject to variations in temperature and humidity. In addition, the wood or metal used as a support for the painting is rarely the same as that used for the frame. Consequently, each will expand and contract differently and will need the allow­ance so that one does not restrict the other and lead to warping and damage. 2. Never nail, toe nail, staple, or screw into or through a canvas support to secure a picture to a frame. Do not do anything that rigidly locks the two together. After you have given an appropriate allowance, you should not defeat it by locking the picture to the picture frame or weaken the support by drilling or nailing. One desirable method employs flat metal strips that attach to the frame at one end, while the opposite end can be bent over the back of the stretcher bars or the back edge of the panel, as shown in the illustration above. These strips should be strong enough, after being bent into shape, to act like springs to hold the artwork into the frame with pressure. 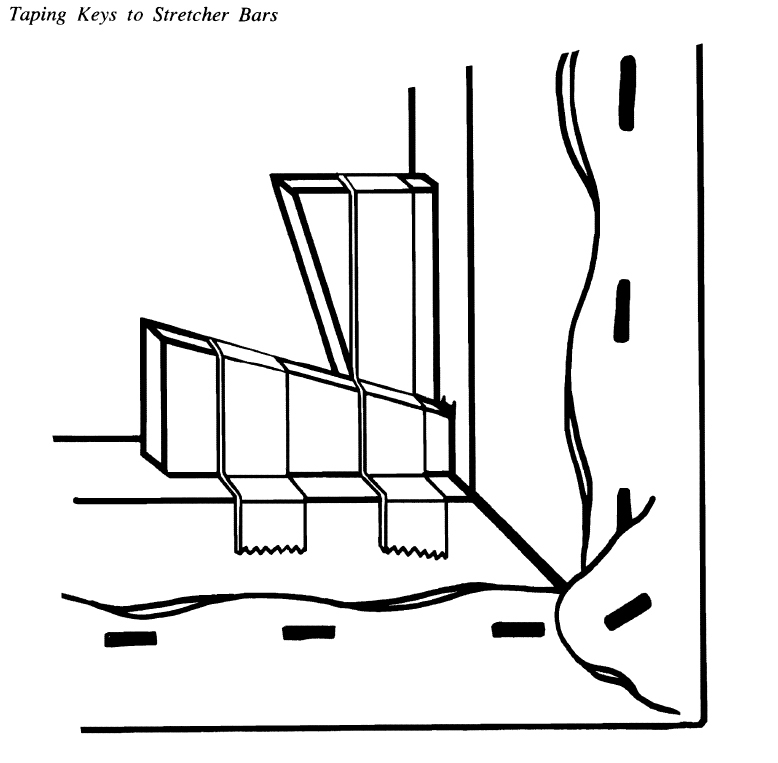 Another method employs triangular steel spring wire clips (see the illustration right), which if used in a similar manner will accomplish the same results. There are two advantages to this method of installation. One is that the picture is secured, but still allows for expansion and contraction. The other is that the spring clips or metal strips can be swiveled in or out of place and the picture can be installed or removed easily without damage to it or to the frame. 3. Never put the surface of a valuable piece of artwork directly against wood moulding; use strips of four ply museum board or felt to isolate the two. It is possible that the finish, gilding, or even bits of wood might adhere to the surface of the painting. Most conservators feel that although the felt or museum board may also adhere to the surface, it is easier to remove from the artwork without damage. 4. Never put screw eyes into the support or the auxiliary support of the paint­ing, but into the frame. It is popular today to use thin mouldings to frame paintings. This makes this rule difficult to comply with. If the painting is very heavy, and the auxiliary support is required to bear the weight of the frame as well as itself, it may warp. Even if weight is not a serious problem, the installation of screw eyes or brackets may weaken the support. However, if you must screw or nail, drill first carefully before screwing them in so that the auxiliary support does not split. 5. Never attempt to restretch an old canvas or unwarp an old panel. This comes under the heading of restoration. As a painting ages and the paint film becomes more brittle, all mechanical adjustments can produce fine cracks that may not be seen at first. These cracks will inevitably become larger and more serious. A professional restorer knows how to soften the paint film carefully to make the necessary adjustments slowly. If the painting is still in the earlier stages of curing (three months to one year), adjustments may be made with less risk. This may be done by warming the unstretched painting on the back with an iron, set on low, to soften the paint film, but be aware that this will rob the painting of some of its life. Then the painting may be stretched, but not too tightly. Whenever possible I do this part by hand, because pliers may exert too much tension, especially on small canvases. Should the back of a stretched canvas painting be sealed? A stretched work must breathe, so sealing the back can seal in moisture and dust, which may lead to mildew. Sealing also prevents easy inspection for the many problems that can arise. Nevertheless, the greatest dangers to a stretched artwork are dents, perforations, and tears from accidents and mishandling. If you feel that you need the extra protection of a backing, there is one method you should consider. Select a thin board—chipboard, masonite, or plywood, drill holes in it for air circulation, and place gauze over the holes to prevent dust from entering. This backing can be fastened to the frame along with the painting either by using spring clips, or by installing a strainer as shown below. Stretcher bar keys are little triangular pieces of wood, which are placed into the inside corner spaces of the stretcher bars and are tapped into place to force open the corners. This creates slightly more tension, which will remove sagging and wrinkles. Before hitting the keys, put a piece of cardboard between the canvas and the stretcher bars. If you slip, you will not damage the painting. Remove the protective cardboard pieces after you have adjusted the keys. On older paintings, even small dents may lead to serious cracks over the years. Just because you cannot see damage now does not mean it has not taken place. After your protective board is in place, give the keys a few gentle taps. If the wrinkles do not come out easily, give up! Although it is rare that stretcher bar keys can fall out and locate themselves between the inside of the canvas and the stretcher bar, most conservators will take some precaution against this. There are two methods. The first one is to place tiny screw eyes in the keys and support bars and connect them with wire. The other is simply to tape them to the stretcher bars. The tape method is riskier because most pressure-sensitive tape adhesives age poorly, weaken, and fail.